I have recently finished this small Portland Limestone sculpture for a friend who had recently lost a number of close family members. 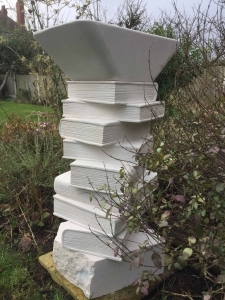 The sculpture contains a number of stacked books, each book has a title that is relevant to each person they are remembering, whether it is their favourite book or the title of a book relating to one of their passions. The untidy stack ensures the viewer has to move around the piece to read all of the inscriptions. Perched on top of the books, is a small birdbath. The stone sculpture has a total height of around 90cm and is constructed in 3 pieces.